Society for Safe Environment and Welfare of Agrarians in Pakistan (SSEWA-Pak) is a nonprofit and nongovernmental organization which has been working since 1975 for the development of rural areas. SSEWA-Pak is a registered under the society act 1866 certificate # 3316. SSEWA-Pak has certification of Pakistan Centre for Philanthropy; quality management setup certified by ISO 9001-2008, it is also a Member of the organization of National Humanitarian Network (NHN-Pakistan) and a member of the organization of Core Humanitarian Standards (CHS). 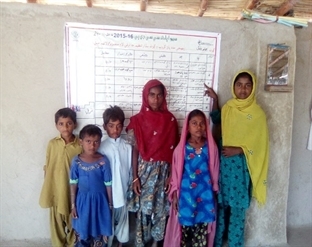 SSEWA-Pak Geographically is working in sothern sindh rural areas although SSEWA-Pak has experience of other regions and had done projects there also. SSEWA-Pak mainly focuses on empowering communities through their involvement and participation. The Central Office of SSEWA-Pak is located in Rattanabad, Mirpurkhas, Sindh while the field offices are situated in Naukot, and Pithoro, Sindh. SSEWA-Pak has a well-established resource center and guest rooms where different capacity building programmes are organized. SSEWA-Pak has 73 well qualified staff working in more than 50 villages and building the capacity of the community in disaster risk reduction, livelihood development, skills development of women and children's education. Villagers of Jeeto Patel village live in this village since a year and before that they were living on landlords given place. SSEWA-Pak CCDP started working in their village since 2014, when the project started working in the village, they were living under landlord’s pressure and had no awareness. CCDP project formed SHG/VDG groups in the village and gave them the training about the savings and record keeping, villagers of Jeeto Patel village were very enthusiastic as they picked the things so quickly and started doing savings and meetings regularly in which they discussed their issues. To enhance their capacity CCDP did different training in their village i-e WASH, Strengthening of SHG’s and VDG’s, SHG & VDG Development plan training. After SHG & VDG Development plan training the villagers of Jeeto Patel village made a development plan in for their village to purchase their own land, to send their children to school, to make a community hall for their village and also mentioned other works in their plan and set a timeline for achieving those goals. For achieving those goals, villagers did meetings together to get the best results, after meetings and dedication villagers managed to purchase their own land, now they are happy that they have their own land and are not dependent on anyone. Also their other goal was to send their children to school and to give them good education, by keeping this thing in mind villagers have started sending their children to school; now 8 village children are enrolled in Government school as they go to school happily. Jeeto Patel villagers are very happy and thankful to SSEWA-Pak CCDP team who by encouraging them and gave them awareness to think out of the box.